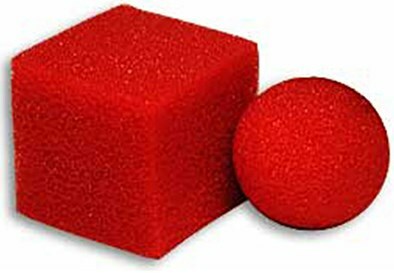 A sponge rubber cube is shown and placed on top of the left fist, which has been shown empty. The right index finger pokes the cube out of sight into the left fist. The two hands are separated instantly. Ask your audience if they can tell which hand the cube is in. It does not make any difference, open both hands, showing a sponge rubber Ball in each hand. The cube has vanished and in its place are now 2 rubber balls. Place the two balls together and once again poke them down into the left fist. Open the left hand and both balls have vanished and inthe fist is the cube again.